We are back at it and I am so thrilled. It is another great day, Faith. It’s a fabulous day, beautiful, snowy, sunny, fabulous. The start of the year has been full of transition for us and specifically that’s where we’re diving in with our podcasts and we’ve tackled some very interesting transitions since the new year, Faith. Yes we have including the impact of relocation, the impact of rage versus civility, the impact of losing your position and the impact of facing death, the impact of personal evolution. These are just a few that we’ve done. And you can find every single one of them right now on our website. 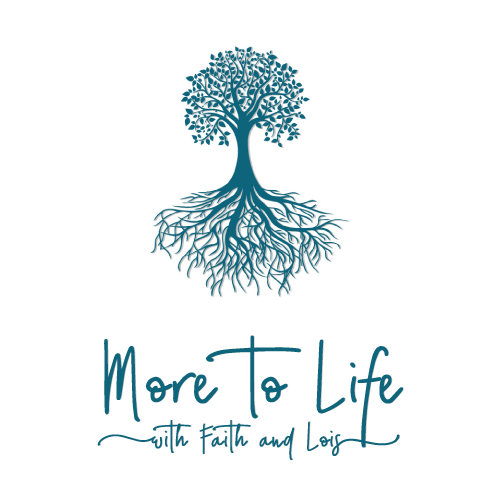 Go to www.moretolifewithfaithandlois.com. You can check them out, you can binge on them if you want on any platform that works best for you. And oh by the way, if you haven’t subscribed on that platform to which you’re listening to us right now, would you take a moment to do that? And, like, rate us? Here, we are ready to tackle a new transition with you today and today we’re on Episode 64. Transition: The Impact of Aging. Oh and this is so important because aging is not about an age. Aging is about, it’s happening to all of us all of the time and it’s amazing how we are impacted at different phases of our life by the aging process. Yes. Because no matter what your age, most of us are afraid of getting older. I mean that’s just kind of normal when you’re three, you wonder what it’s going to be like when you’re four. When you’re six, you want to be 20 I mean this is just kind of normal. So fear of aging is one of the most common fears that are out there. Faith. At what point did getting older hit you? Actually for me, it’s been more recently because I have embraced each of the decades that I’ve gone through and have enjoyed them. And felt there was something exciting about the next decade that I was entering into. But then all at once, suddenly my body wasn’t doing what it used to do and I could see like, oh my goodness, aging really is having an impact. So I think it’s been more probably in the last five years. Aging for me hit most clearly when the youngest of my three boys was about two or three years old. And it dawned on me that all of the answers my kids were getting that were from the home front came from myself or their father. Of course they got instruction in school and in their place of worship and they had friends, but we were the source of their wisdom. We were the alleged answers to a lot of their questions. You know, I could no longer rely on my parents or aunts and uncles. It had come on me and I never thought of myself as the person that could be the dispenser of that kind of knowledge and information. And so that made me feel like I am finally accepting that I’m getting older. Wow. That I’m growing up. And you know, we’ve talked a lot about young people go through a phase that they like to tease and call ‘adulting’ that they don’t want to get to and that they worry about what should they do now. But I think people in their late twenties now are starting to figure this out, that hey, they are having to grow up. Absolutely it’s a part of life is to move into that transition of new responsibility, new adventures and new way of doing life from the way you’ve been doing it. And today we’re going to visit some issues that accompany our fear of aging. And hopefully we’re going to encourage you that wherever you are, you are living your best life. And, and what if you could change your perspective on aging and see your life as something that is full of possibilities or opportunities and adventure. Would that, have you look at your age, whatever it is right now differently? It should because life is always filled with the potential of new adventure, new discoveries, and a new understanding of how to live your life out. But if we lose sight of that, you can find yourself feeling very restricted in life. You know, there’s a great quote and I’m not even sure who said it because it’s been revised so many times, but in your 20s and thirties you worry about what other people think. Then in your forties and 50s you stop worrying about what other people think. In your sixties seventies eighties nineties you realize they were never thinking about you in the first place. That’s a great way to deal with it. And the beautiful part about that little fun quote, it’s the fact that it really is kind of laying out the stages of life. And if we can look at it more that we are going to move through stages of life, which are each one is developmental. And it helps us prepare and to enter into the next phase. Then the whole aging thing is less intimidating. And yet there are some issues that many of us look at and go, Ooh, this bugs us! So we’re going to look at a few of the issues that bug us about aging and then give some opportunities to look at how to maybe reframe whatever age you’re at so that you can look at the seasons that you’re in through your life. So how about this? One of the fears that many people have as they’re getting older is that someone younger is going to get my job. Or take your place or be better than you or have more education than you. And there’s a lot of things that we put on to that younger person that’s coming up from behind us and it’s intimidating and it’s threatening. Don’t take my place, don’t know more than me. And it’s learning to work with the next generation coming up rather than fighting it and resisting it. But yes, of course, if somebody is coming in and you have a job, you don’t want them taking that job. But what is important is how have you prepared for maybe your next step up into using your wisdom and your knowledge and your abilities to maybe being a different position. Right? If that’s what you’re called to do. And also I think it reminds me as I’m in my position to do the best I can so that if someone is going to come and take my job, they’re going to have to kick me out. If that’s where I’m supposed to be or think I’m supposed to be, then if I’m giving it my all, then at least I’ve done everything possible. It wasn’t taken from me because I was not paying attention. Right. So I love that idea that you know, we don’t grip too tightly, but if it’s something you love to do, do it with all your heart, with everything you’ve got so that when you go to that next step, which we all eventually do, go to another step, we leave this thing behind knowing that we’ve done everything we could. That’s good. So that’s really good. What about the mirror? That’s what sometimes really gets to all of us. Me included as we think about aging. Like am I going to recognize myself when I look in a mirror? And it really doesn’t matter what age you’re talking about here because people in their twenties faith as you know, are concerned about fine lines. I didn’t know you even had a fine line at age 20 – do you? Exactly. Well, it’s more I think what society is putting on to that age. I had somebody that I knew and they love to do the various clubs around Denver, which was a whole society type of inner circle. And she was beautiful and loved to do it, but 20 and a half, 21 she said, I’ve only got a year left, and then I’m out. And it was like, are you kidding me? That’s that whole thing about Mirror Mirror on the wall, who’s the fairest of them all? But that comes to life within, I think the younger generation, where youth and vitality and beauty is being so overly emphasized to the point that you fit if you have this. That’s sad. That at 22 you think, you’re at the end of this cusp. And yet as as young people, as people in their middle ages, as people, as they’re getting older, we do use this mirror kind of as a barometer of this isn’t the way it used to be. And then the ‘shoulds’ come in, right, and shouldn’t it be so, you know, for all of us who still want to do a regimen of making sure we get enough sleep, drinking enough water, or doing certain amounts of exercise, eating well, you know, it still happens. That’s what happens with life. And one of the things I love doing is going back on pictures and looking into the eyes of someone in a photograph and knowing the wisdom and the life they’ve led. And sometimes you can see that it’s been hard and yet you find a way to smile because you’re gardening or you’re holding a child or you’re playing with a dog and you see that joy come through no matter what the age. That’s the wonder of life, of learning to live it and to embrace it for what it is rather than what fits and what other people are telling you is beauty and wonder and youth and all of that. So yes, so much of what we’re talking about here today is finding the deeper meaning in life so that that comes through. So that’s what we build our foundation on in life rather than the lines or the actual number of this next birthday that you want to hide and not enter into. Each phase should be just an absolute total wonder and a gift that you get to live it. And what comes out through this smile is what you’re putting in and what comes out from inside – from deep inside. We love that. Another thing that most of us face that we fear as we age is what happens if I get sick? Because this is so, so much of a reality. We all fear getting ill and not having control over our bodies or what our bodies are doing to us. But that happens at any age. There’s precious children who are suffering and have to face the difficulties of an illness or in a teenage year or an injury that’s unexpected. You’re going to have a career in the NBA and all at once you break a leg and it’s done. You know? It’s like those are the unexpected realities of life that if we crumble and are crushed entirely because of an event or because of an illness, then we’ve lost ourselves. Because there are ways to move through what we have to face, what we have to endure. But we don’t get sick just because we’re getting older and we want to encourage you to just know that. And I know you know that. I know we know that, but we fear it because we just look at getting older as the potential for being bedridden or sick. Absolutely. And the reality is, yes, our bodies are going to decline. So you can’t necessarily do the things that you did when you were 20 or 30 or 40 or 50. But what you begin to do is find doing the same things in a different way. How can I still go on that hike, but I’m not going to do a 20 mile hike. I’m going to do a two mile hike or I’m going to do a 10 mile hike by taking several rests in between. It’s the pushing. It’s the saying, I need to be young. I need to be able to do what I did before. That’s where we begin to actually do more harm to our bodies instead of working with our bodies. And that’s the beauty of what you’re bringing up, that we still keep ourselves to the level we’re able, healthy and functioning and doing those things that bring us joy because we still can whenever we can. Another fear that we all have is can I take care of myself financially? And I think here, one of the things we would encourage is start wherever you are right now and think about it versus waiting until you’re at a point where you haven’t thought about it at all and you realize, oh my goodness, what am I going to do? It’s a way of life. It’s a thinking and it’s hard for many of us to say, I want to sit down, I want to draw out a plan of what this is going to look like. You know, am I looking ahead to setting aside financial means for myself? That’s a challenging one because we hit our mortality when we do that, don’t we? Right, exactly. It’s like taking responsibility and saying what is it that I want it to look like out there? You know, further down the road and then to begin to plan for it now. And I’ve heard so much about how the generation coming up has not learned how to save and it’s something that is not on their radar and – start thinking about that. How could I get a piggy bank and start putting some extra money in there every single week? And use that as a means of a stimulant to say I want a future that I can really feel confident in. So we’ve looked at a number of questions and issues that we wrestle with as we struggle with the fact that we are aging. And now we’d like to suggest to you there are other ways to look at the seasons of our lives and they have a lot to do with grace that you can extend toward yourself and others. And the first one really high on the list is enjoy your relationships. Who’s around you. Love them and relate and hang out and be present. Yes, be involved. Do those dinners. Do those parties, have them over for a spaghetti, whatever it is that brings you joy to spend time with your friends and with family members, because those are the treasures you’re going to carry into the future. So as the aging process continues, you’re going to hold onto those memories for the rest of your life. Another thing we can do that makes the seasons of our lives go by in different paces is take the action that you need to make a difference in life. And not just your life, but the life of somebody else. Maybe it’s somebody you know. Maybe it’s somebody you don’t know. But when our focus is separated just from who we are and what we’re gaining and where we are, it’s amazing how we realize that a lot of people are going through things far worse than we are. Every day we have the opportunity to impact another life, whether it’s at work, whether it’s on the home, it’s a kind word, it’s a helping hand. It may be bringing in a little gift or a card of encouragement, whatever. Those are the kinds of things that you make a difference. And why would you want to miss out on those? Why would you want to withhold those times in life? So if you can begin to see that it’s a landscape that you have the right to paint something on – not only your landscape and on someone else’s, it makes life very meaningful. Boy does it. How about embracing good health practices? You know, we are not here to hold out a ruler and say, eat this kind of food or make sure you get this kind of exercise. But we know our bodies and for most of us having a good diet and getting enough sleep and hanging out with the people we love and having exercise will give us a longer period of life because we’ll be healthier. Right? And so if you do the healthy based on your own body, now you’re in sync with what will work for you. Don’t do it based on what another person does or what some ad on TV tells you to do. Do it with what is my body telling me. But respond to it and honor it and listen to it and you will feel much better. And look at the risks that you take. Are they ones that give you energy because you’re doing something really fun or are they life threatening because of what season in life you’re in. I mean this is also a time to take a pause and you know, examine the kind of health practices you’ve set up around yourself and appreciate them for making you a healthier person. Yes, absolutely. And when another one is exercise your brain, and I just want to jump in on this one because my husband is brilliant at exercising his brain. For 20 years he’s been working on Spanish and every day for an hour he does Spanish vocabulary and he does it mainly because he read that learning a language and working on it actually stimulates the brain. So he’s very faithful to it, has not missed a day. And the other thing he does is he does one of the online computer brain training things and oh my goodness, he’s in the 98th percentile. Jumping way past his age bracket. And it has helped him and to keep his brain sharp and he reads a lot. So you see there are things that we can do to stimulate our brain to help our brains. They’re very elastic and they will work for us, but if we become stagnant, they will begin to become stagnant as well. Right. And if we want to keep learning, if our goal in life is that we either learn something new on a regular basis, whether it’s every day or in a season, this is a piece of that and we can’t learn and expand without introducing new thoughts, new ideas from someplace else. That is so fascinating. Language – an hour every day. That would be awesome. Also be creative and I don’t know what that looks like for you. I think sometimes when we say be creative, people go, well, I’m not really artistic. Well you can be creative in so many different ways and I encourage you to look at what brings you joy. I mean it might be decorating your house or if you know Faith, it might be the presence that she wraps with such decor or the way she puts together cards. I mean those kinds of things just bring out the joy that’s inside you, Faith that is creative. You have to find the things that really awaken within you and whatever that is and whether it’s baking or you are an artist like my granddaughter. She just works at it every single day. Do something that expresses what’s inside of you and find what that is and live it out because it’s a gift and you’re leaving a legacy in it. And then go outside. However you can enjoy nature, do it. I mean, some of us live in climates where it’s extremely cold in the winter and yet we can find ways to bundle up and get out and still enjoy the elements. Some of you live in an area where it’s absolutely beautiful and warm. You can go out with very little on and enjoy the elements, but the idea being you get something else to give you stimulation that allows you to appreciate where you are in life. And that’s the whole point of this discussion that we’re having here. Yes, and wherever you live, there’s beautiful creation all around you. Find it, walk in it, smell it, experience it and take it in because it changes your perspective. And when we can change our everyday perspective into seeing the broader picture of life, that gives us life. And that’s what we use the outdoors and nature to give us is a new image of life. And at the end of it all, what do we leave behind or to our friends or if we relocate, what is the aroma that follows us as we leave a neighborhood. That also is part of this growing and aging gracefully that we take so much in that we give so much back that that’s what we leave to people that they understand that we love living life, whatever that looks like. Exactly. You are not going to be remembered and this is not to be morbid, but you’re not going to be remembered for the beauty that you carried on the outward appearance. What is going to be remembered as what you left, your kindness, your goodness, your charitable heart, the things that you expressed and created and your brilliance in offering something, a helping hand. There’s so many things that we can leave as a legacy, but if we are so fixated and afraid of the actual body aging, the reality is it’s going to be buried or it’s going to be cremated and that’s not going to live on, but your legacy will. People will remember you for who you are and for the things that you did. And that is the beauty of aging. It should mature over the years. Absolutely. And you know, when you examine these things and look at life from whether or not a year relationships are strong or your health practices or your brain – what starts to happen is that you don’t obsess about the next year that you’re facing. And, and that’s when you realize how much you have to offer. And that’s what we encourage you in our podcasts, More to Life. No matter what your age, we welcome you to our year of transitions on More to Life with Faith and Lois. And we hope that if you enjoyed this podcast, you’ll share it. Each of you has so much to offer and we hope you will seize the moment to live your best life. And join us next week for Transition, the Impact of Regret.